When I lived in Geneva for 10 years in the nineties, there was no shortage of cheese and French haute cuisine. There is nothing wrong with that. However, from time to time I found myself craving exotic, spiced flavors from further corners of the world. Short of the falafel truck outside of La Placette, there were few alternatives. The few available ethnic restaurants were often overpriced and underwhelming – Swiss interpretations of the real gritty deal. So, I quickly learned to make my own versions of curries, satays, and spring rolls at home. They were hardly authentic, but I was able to satisfy my wistful taste buds. One day, I came across a recipe for Country Captain in a cooking magazine. It was a sweet tomato-based chicken stew, studded with apple and infused with curry. It seemed easy to prepare with ingredients I could readily find in the Swiss suburbs, so I made it. The stew was light and fresh, pleasantly balanced with the acidity of tomato, sweetness of fruit and a nice kick of curry. For no real reason, I didn’t make it again. The recipe was filed, and over time I forgot about it – until recently, when I stumbled across a recipe for Country Captain in Saveur Magazine. As soon as I read the name, I was transported back to Geneva when I first made the stew and reminded of how much I enjoyed it. Country Captain is a dish that originated in the American south. Influenced by the flavors of India and introduced to the U.S. by British officers, it’s a mild stew, usually garnished with currants and almonds and served with rice. It’s not overpowering and it’s heat may be adjusted according to taste, which makes it a great family dish. 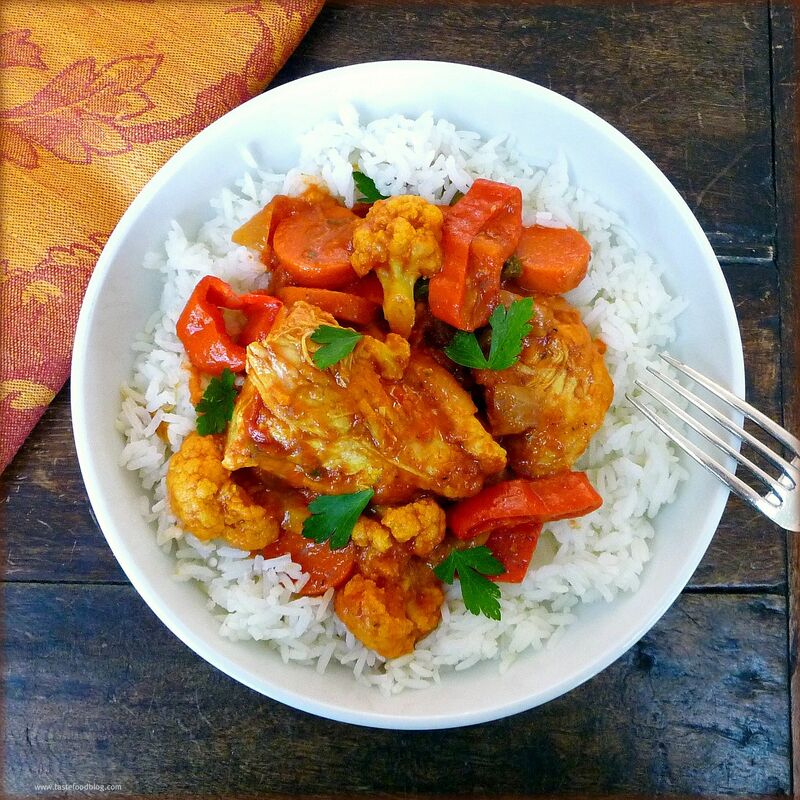 This recipe for Curry Chicken Stew is inspired by Country Captain, however, in my version I add more vegetables and omit many of the extra garnishes. This recipe calls for chicken off the bone, which shortens the cooking time and makes it easy to prepare as a weeknight dinner. Serves 4-6. Preheat oven to 325 F. (170 C.) Heat 1 tablespoon olive oil in a deep skillet or Dutch-oven over medium-high heat. Salt and pepper the chicken pieces. Add chicken in batches to the skillet without overcrowding. Cook until brown, about 3 minutes each side. Transfer to a plate. Add 1 tablespoon olive oil to the skillet. Add onion and sauté 2 minutes. Add carrots, cauliflower and peppers. Saute until vegetables begin to soften, about 4 minutes. Add curry powder, ginger and garlic. Cook, stirring, until fragrant and the vegetables are thickly coated with the curry powder, about 2 minutes. Add tomatoes, bay leaf, brown sugar, 1 teaspoon salt and 1 teaspoon black pepper. Simmer 10 minutes. Return chicken to the skillet and partially nestle the pieces in the stew with the browned skin exposed. Cover with lid or foil and transfer to oven and bake, 15 minutes. Remove lid and continue to bake until chicken is cooked through, about 15 minutes more. Serve stew in bowls or deep dishes, spooned over basmati rice. Garnish with fresh parsley or cilantro leaves. I keep staring at this photo of your curry because the colours are so unbelievably vibrant. I was in Toronto a long time ago, yet I remember it as a wonderfully international city with many ethnic influences. Lucky you! This looks wonderfully delicious, just a quick question…is it possible to make this with chicken with the bone still in? Yes, certainly! Be sure to adjust the oven cooking time: it will take longer with the bones in. awesome, thank you so much for your fast reply!